Getting on the train and leaving Taiji is one of the most difficult things I have ever done. Every single Dolphin Project Cove Monitor I know feels the same way: Once you have witnessed the atrocities that dolphin hunters and dolphin trainers commit against dolphins in the Cove, part of you can never leave. There is no way to un-see what you have seen. The scenes of horror will stay with you forever. On the day I left Taiji, I took with me the dreaded sound of the hunting fleet’s banger poles. That sound of the dolphin hunters’ repetitive banging on metal poles will always echo in my head when I close my eyes to go to sleep at night. The banger poles create a terrifying wall of sound underwater so the hunters can drive the pods of dolphins into the Cove. The images of panic-stricken dolphins trapped in the Cove are ingrained in my memory. The sounds of their distress calls as the hunters force them onto the rocky beach and tie them down underneath the tarp to kill them replay themselves in my mind endlessly. Dolphin Project Cove Monitors have witnessed and exposed the killing of thousands of dolphins in Taiji’s infamous Cove of terror. We have seen many dolphins being taken into captivity by dolphin trainers. And no matter how many times you have witnessed it, each time feels like the first. Nothing can prepare you for the violence with which dolphin hunters and trainers subdue the dolphins and separate mothers from their offspring. Their lack of feeling and empathy is unfathomable. Nothing can explain it in any way that makes sense. Nothing can justify it. Dolphin trainers rush to the Cove as soon as they receive news that the hunters have caught dolphins that belong to a species that the dolphinarium industry wants. Working closely with the hunters, they begin selecting the ones that fit the desired gender, size, age and looks. A lot of money is at stake. 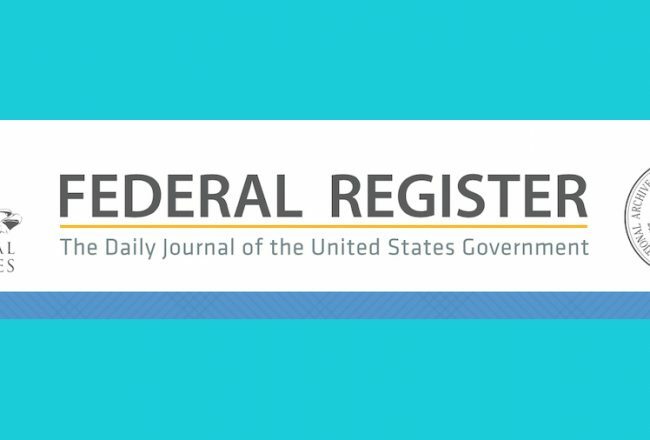 A live dolphin sold to the dolphinarium industry can bring in 153,000 US dollars or more. For the trainers, the selection process is just another day at work. Trapped dolphins are fighting for their lives all around them, but the trainers pay no attention to them. Focused on the task at hand—selecting young dolphins that can be trained to perform in profit-making dolphin shows and swim-with-dolphins programs—they make no attempt to help any dolphins. The process sometimes lasts several hours, but trainers ignore the dolphins that are bleeding from wounds sustained when the hunters run their skiffs over them to force them onto the rocky beach. They overlook the ones that are trapped underwater struggling to free themselves from the nets to reach the surface to breathe. The trainers take their time inspecting the dolphins and choosing the ones they want. They know that the hunters will kill the ones they do not select. They feel they have a right to decide who lives and who dies. The hunters try to hide the dolphin hunt behind barbed wire, tarp and chain link fences. Town officials have erected signs all around the Cove that tell people to stay away. “No Trespassing, Danger for a falling rock,” is the most commonly used warning meant to steer people away. The world is not supposed to know what goes on underneath the tarps that the hunters erect above the scene just before the selection process and slaughters begin. Live-streaming from Takababe Hill, we can hear the dolphins splashing underneath us while the killing goes on. Sometimes we can see the tethered dolphins through a crack in the tarps We might see a hunter sitting on top of a dolphin, holding it down as he jams a metal rod into its spinal cord. We won’t see that hunter jamming a wooden dowel into the wound to prevent the flow of blood into the Cove. But that is what happens in the Cove. The struggling goes on for a long time. And then all becomes eerily quiet. The slaughter is over. An entire family of dolphins is destroyed, just like that. 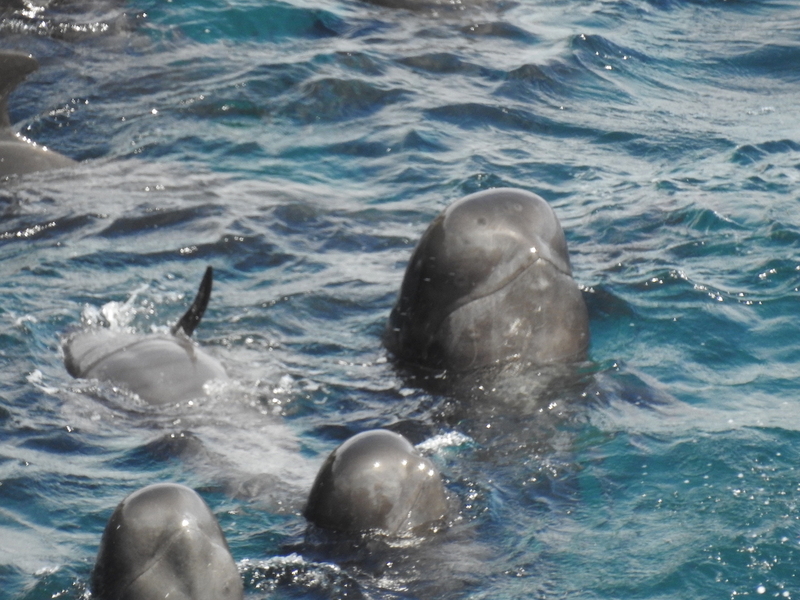 What occurs in the Cove represents cruelty in its most concentrated form. There seems to be no limits to the suffering that hunters and trainers inflict on their victims. 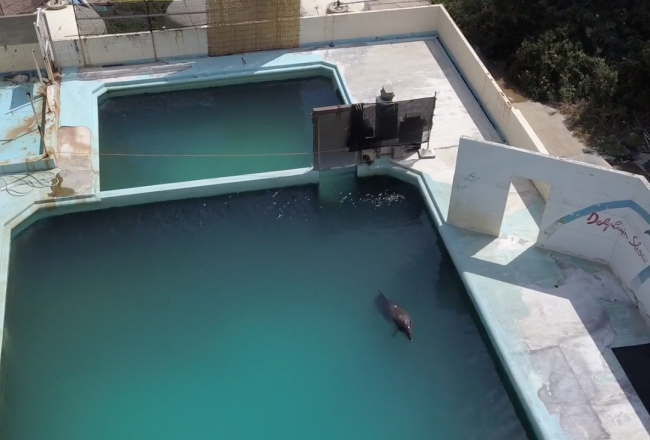 When trainers force a calf away from its mother, both dolphins cry out in anguish and torment. The trainers are unmoved. 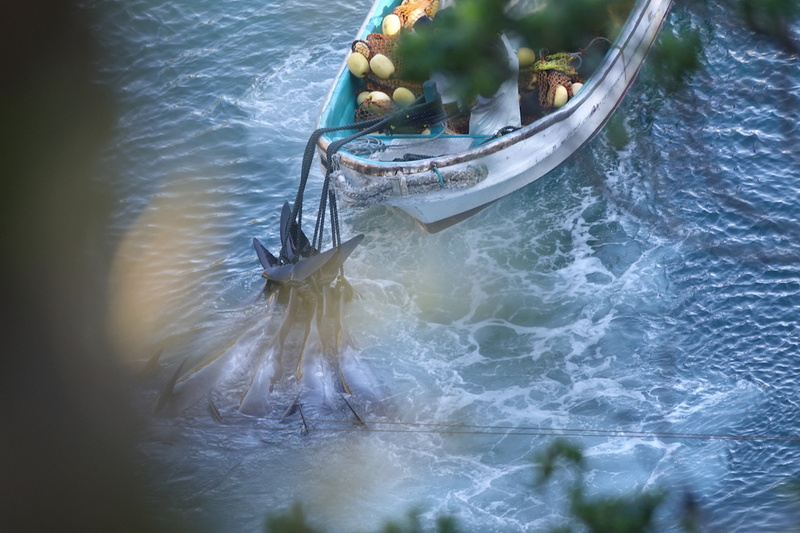 When the trainers take the calf away to dump it into one of the sea cages in Moriura Bay, the mother continues crying out for her calf to be returned. The trainers ignore it. There is no empathy or even sympathy. While witnessing and live streaming from the Cove we are surrounded by coast guard members, armed police officers and town officials that monitor our every move. It is difficult to describe what it feels like to witness and document the slaughter and not be able to stop it. One word, however, covers it better than any other I can think of: anguish. We feel anguished at the sight of dolphins huddled together in the Cove, pectoral fins touching for comfort. The little ones are in the middle; the grown-ups circle them, trying to protect them. Prior to this, the banger boats have chased them for hours out at sea, and many of them have lost their strength. Some can barely stay afloat. They know that something terrible is happening to them, but they don’t know just how terrible it is going to get. The Cove in Taiji is a dolphin´s worst nightmare, and when the killing is over, hunters drag the lifeless bodies to the butcher house. Right past their surviving pod members. 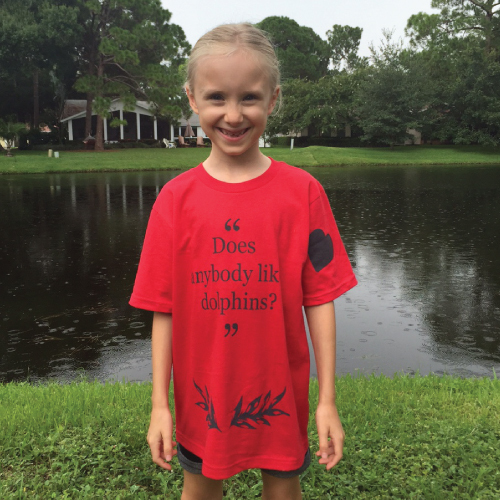 Words of encouragement from supporters mean everything to a Dolphin Project Cove Monitor. Knowing that there are people out there who dedicate so much of their time getting the word out about the slaughter makes us feel that we are not alone. But I have also heard some people questioning the value of live streaming from the Cove. “The world has already seen footage of the dolphin hunt over and over, so what is the point?” one person asked me. But here is the thing: There are still people who have never heard about the hunt and who have never made the connection between the dolphin drive hunts and the captive dolphin industry. If people were informed, many of them would stop purchasing tickets to watch dolphins perform or swim with them, and the dolphin captures in Taiji would come to an end. I am convinced that Taiji´s dolphin hunt will end the day enough people rise up against it. We especially need the Japanese people to speak out. For these reasons alone, documenting and exposing the hunts is imperative. But there is more to it than that. The dolphins that are killed or taken captive in the Cove should never be reduced to numbers or part of a statistic. They are individuals. No two are alike. Each and every one has his or her own story, and this is what our effort is about: putting a face to the victims. Some of the dolphins get trapped in the nets and drown, and some are tied down with ropes and killed. 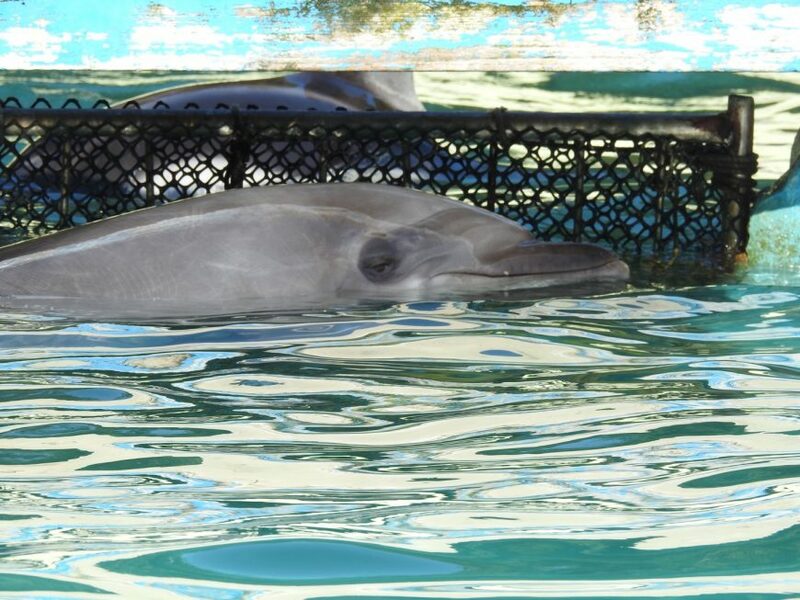 Others are kidnapped by trainers and dumped into sea cages where they will undergo training and be sold to dolphinariums in Japan or abroad. And some are pushed back out to sea, exhausted, in shock and visibly injured. We have seen a melon-headed whale lying on his back after the hunters drove an entire pod of them into the Cove. He was exhausted and just lay there on the surface of the water, surrounded by pod members who tried to comfort him. This particular dolphin´s story means something. We have seen a melon-headed whale calf panic and throw itself against the rocks in a futile attempt to escape. The calf kept thrashing against the rocks for what seemed like an eternity. A diver grabbed hold of the dolphin and threw it off the rocks, as if it were a piece of garbage. 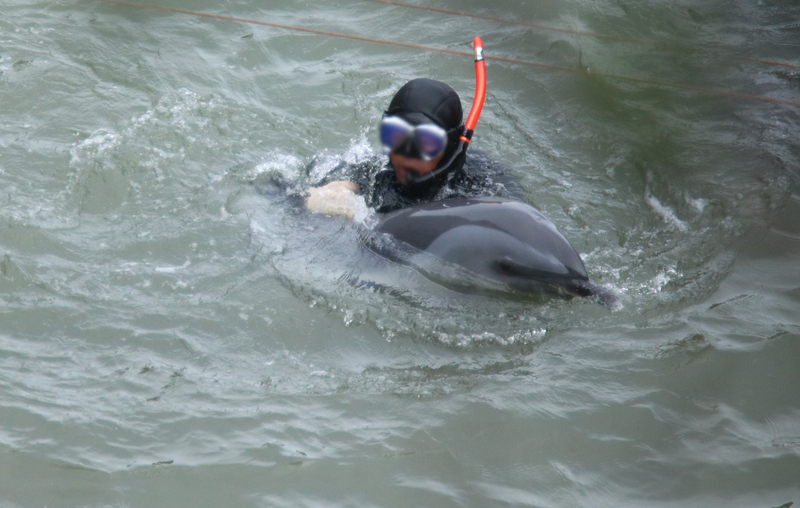 Not allowing the cruelty against this particular dolphin calf to go on in secrecy is crucial. We need to do all that we can to hold the dolphin hunters and trainers accountable for what they are doing to each individual dolphin in the Cove. 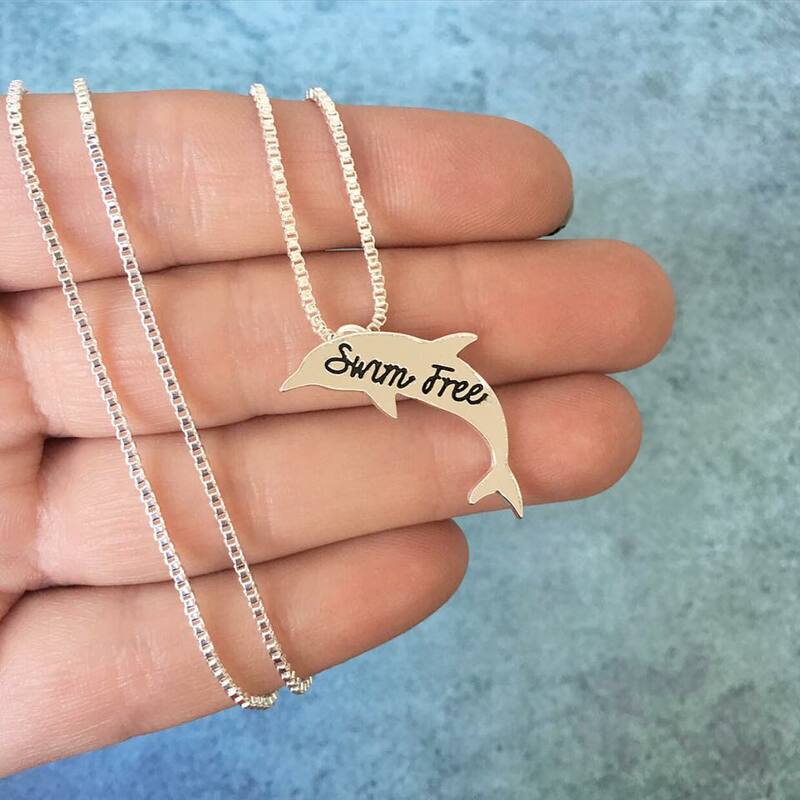 Each and every dolphin matters. Dolphins are self-aware. 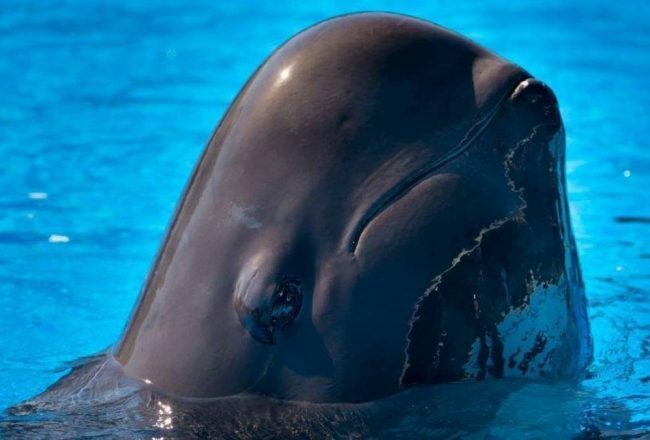 They recognize themselves as individuals, and they recognize each member of their pod as an individual. Dolphins possess highly developed cognitive, empathetic and memory capabilities. 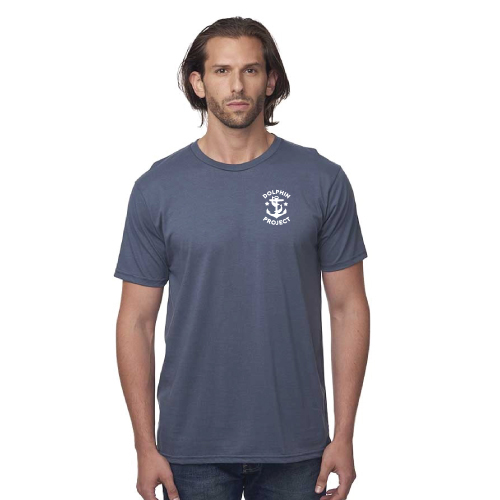 They show loyalty to one another and share incredibly strong social ties. Time and again, our Cove Monitors have witnessed surviving dolphins refusing to leave the place where they last saw their families alive. The hunters had to force these dolphins out of the Cove and back out to sea with the banger poles. We cannot walk away from the Cove simply because we feel anguish and heartache and sometimes lose hope that this madness will stop. 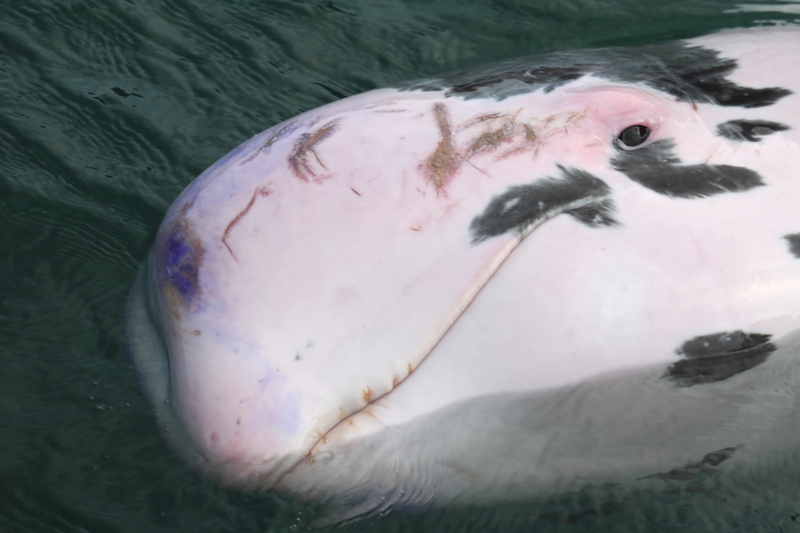 For all their capabilities, dolphins cannot communicate their suffering to the outside world. We need to continue to be the voice that they themselves cannot be. We can never allow the world to forget. In the same way that dolphins, in their tremendous loyalty and empathy for one another, refuse to abandon their doomed pod members, we need to do the same for them. So whenever I hear someone say, “What is the point?” I return to the Cove in my mind and once again see a dolphin calf making a desperate attempt at escaping, its tiny, abused body thrashing against the rocks. And here, in this harrowing scene, lies the answer.